Dr Livingstone thought that Victoria Falls sounded better than the local name Mosi–oa-Tunya which means “the smoke that thunders”. The government says that it is going to change the name back, which has got people worked up in support and against, but is hardly among the more urgent things which need to done in Zimbabwe. To outsiders, at least, it is what the falls are which matters most, not what they are officially called. 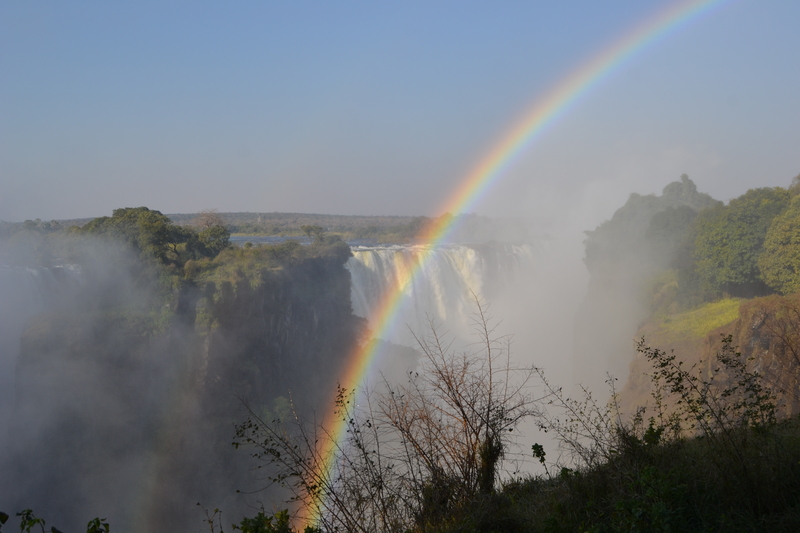 The word “awesome” has become as devalued now as the old Zimbabwe dollar but, when it pops into your head at Victoria Falls, it belongs there. A mile of water, hurtling out of control, tumbles over the edge and disintegrates into abstracts: thick gouache white swirling over slime green, tumbling, tumbling, tumbling a hundred metres into the gorge below, hissing and rumbling, roaring and thundering like some massive industrial process; the spray rebounds, a gathering storm, higher – way higher – than the top of the falls, until a perfect rainbow chops it in two and it comes down again as an unseasonal shower and soaks the path and the tourists who stand there and gawp. Vic Falls ruin waterfalls for evermore as surely as the Grand Canyon ruins canyons.